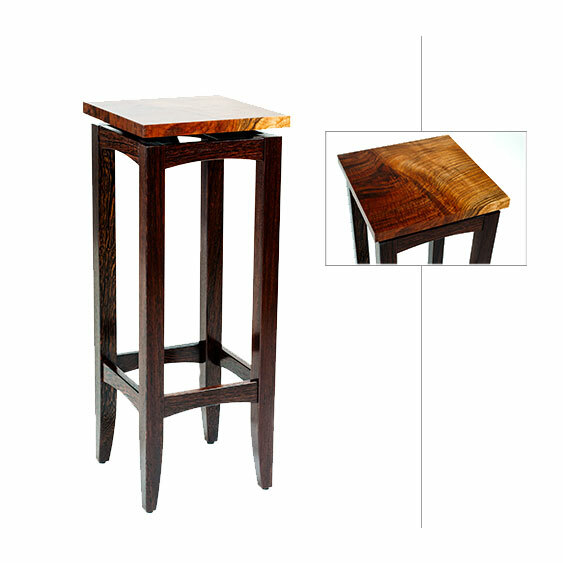 Description: This beautiful sculpture stand highlights the spectacular grain of the claro walnut top. The sand dune like grain is from a reclaimed slab of claro walnut with an English walnut graft, a walnut-producing tree found a second life in spectacular lumber. The top appears to be floating on the beautiful wenge base. The craftsmanship is exceptional with beautiful and sturdy joinery, a reclaimed grafted top, and a satin smooth finish. This is a perfect piece to display a beautiful bronze or wood sculpture.